The word `philanthropy', according to JRD Tata, means much more than mere charity. The distinctive characteristic of the Tata Trusts is that they have always borne the human aspect in mind. The smallest grant made by the Trusts, one year, was Rs 125 for a pair of spectacles for a poor man who could not otherwise afford it. For that man it meant the difference between light and darkness. The Tata founders bequeathed most of their personal wealth to the many Trusts they created for India and its people. Today, the Sir Dorabji Tata Trust, the Sir Ratan Tata Trust and other allied trusts together control approximately 66 percent of the shares of Tata Sons, the holding Tata company. The wealth that accrues from this asset supports a canopy of community development activities, encompassing every sphere of human interest, including science, education, art and culture, health and community welfare. The Trusts are purely philanthropic arms of the Tata Group and engage in activities quite independent of the corporate social responsibility (CSR) activities of the Group companies. In their entire saga of giving, the Trusts have responded to the call of the times, innovating and remodelling, and in turn setting path-breaking milestones. From Patchwork to Constructive Giving It was in the late 19th century, around the same time that Andrew Carnegie and John Rockefeller were experimenting with philanthropy in the US, that Jamsetji Nusserwanji Tata saw the need to use his wealth to catalyse an industrial revolution in the country. While Carnegie and Rockefeller had the advantage of operating within a climate of freedom, Jamsetji had to venture out in an environment of servitude, in a primarily agricultural country, drained of its vitality by foreign rulers. He realised very early that `patchwork philanthropy'- giving a bit of cloth here and food there - would not go far. So he formulated a philosophy of `constructive philanthropy.' In Jamsetji's own words, quoted in RM Lala's `The Heartbeat of a Trust' - "What advances a nation or community is not so much to prop up its weakest but to lift up the best and the most gifted so as to make them of greater service to the country." This philosophy of `constructive philanthropy' became embedded in the Tata Group's business ethics and giving philosophy. While Jamsetji could not neglect the immediate pressing needs of the multitudes, the focus had to remain on long-term and self-regenerating projects. For example, instead of setting up a single school, he decided to impart education on a continuous basis, which would then lead to skill-building and eventually to income-building, placing a whole generation on the first step of the economic ladder to prosperity. Jamsetji believed that India's road map out of poverty would involve giving opportunity, not handouts. Thus was established the JN Tata Endowment in 1892 to fund Indians wishing to study in England, and the Indian Institute of Science in 1909, now considered a premier institution in the world. The Legacy, The Trusts Following the tradition of national service set by the father, Jamsetji's two sons, Dorabji Tata (1859-1932) and Ratanji Tata (1871-1918) established two Trusts that form two of the biggest entities in the Allied Tata Trusts ¬ Sir Ratan Tata Trust (1919) and the Sir Dorabji Tata Trust (1932). These two Trusts and their allied institutions are at the heart of the enduring Tata commitment to community development. Both the sons bequeathed most of their personal wealth to the many trusts they created. The Trusts established a number of pioneering institutions, all in Bombay - the Tata Institute of Social Sciences, in 1936; the Tata Memorial Centre for Cancer Research and Treatment, in 1941; the Tata Institute of Fundamental Research, in 1945; the National Centre for the Performing Arts, in 1966. The National Institute of Advanced Studies was set up in 1988 and the Sir Dorabji Tata Centre for Research in Tropical Diseases in 1999, both in Bangalore. Beyond these institutes, the Trusts' main grant-making priorities include natural resources management -- particularly water harvesting and conservation -rural livelihoods and communities, education, health, civil society and governance and arts and culture. Planned Philanthropy Towards Nation Building The post-Independence and pre-reform period saw the Tata Trusts involved in a phase of planned and strategic philanthropy. It was a time for strategic experimentation, and it was a time for the imaginative use of money to find solutions to national problems. Foreseeing India's future needs, the Trusts had regional and national development on its agenda, particularly in the vital sectors of education, health and agriculture. The Trusts took up several pilot projects in these sectors and went into implementation mode by establishing an integrated rural development project in Man Tehsil of Satara district. This project brought about a sea change in the villages in which it operated. These pilot projects brought about significant behavioural changes, impacted policy making, and generated new insights for people who were involved, and set a whole wheel of learning into motion. Particularly notable was the way they adhered to the national agenda, working hand in hand with civil society and the burgeoning NGOs during that period. 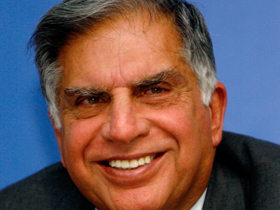 By this time, Tata philanthropy had almost patented a professional, secular and "arms-length" approach to philanthropy. Also by this time, they recognised the need for a more structured approach to their activities and a deeper understanding of the issues involved. Who the project would benefit and how, whether it would be sustainable in the long run or not, all these had become unavoidable questions. Over time, reaching out to the unreached and providing succour to the needy, the unfortunate and the disenfranchised became as important a goal as building up the best had been in Jamsetji's time. Challenges Post-meltdown Today the Trusts are clearly redefining their role. Moving away from a benefactor-dependent model, they are now all about partnerships and engaging with worthy organisations. In today's complex global society, social disparities in access to resources are one of the main challenges in the philanthropic arena. To meet this challenge, the Tata Trusts are now developing a more entrepreneurial style of giving. While Tata philanthropy continues to evolve, what remains constant is its strategy of empowering marginalised communities to take the reins of their own development. The Trusts have nurtured several pioneering development initiatives in fields as diverse as education, the criminal justice system, micro-credit, urban poverty and of course, livelihoods. It is not an exaggeration to state that virtually every NGO that has earned some reputation for its good work is either a current grantee of the Trusts or has been a past grantee. The focus of the Trusts' philanthropy has now changed from an equity-based partnership of yesteryears, to stake-building. In recent years, the Trusts have attempted to leverage philanthropic resources by forging synergies and links between grantees wherever possible. In the words of Ratan Tata ¬"Philanthropic institutions in India still believe they're charitable and therefore must operate on a shoestring, [and] that creating an organisation is almost a luxury. This needs to change - they have to recognise that a non-profit has as much responsibility for being professionally run as a corporate body." During a review meeting in 2004-05, it emerged that the Trusts' ownership was not integrated into the planning and work systems of the overall Tata Trusts. The Trusts asked a professional team to conduct a sector-wise examination of philanthropy in the fields of education, health and others. These sectoral examinations investigated who the other big donors were, what schemes were in operation through state, local and central governments, what was the body of best practice in the field, and what the major challenges were. This exercise also identified new areas of interest like urban poverty and livelihoods, civil society, human rights and governance. The economic downturn has had a marginal effect on the Trusts' access to resources. For instance, between 2007-08 and 2008-9, the total amounts given away did not decline in any way. Moving forward, postrecession, as the largest funding agency in India, the Allied Tata Trusts must bear the onus of a major role in the country's development agenda. Foreign donors cannot set the tone of development for the country, and therefore the Trusts are willing to take the lead and collaborate with the government. The question is - how will the Trusts' giving make a difference to the poor man who cannot afford glasses?